What is the range of diversity in linguistic types, what are the geographical distributions for the attested types, and what explanations, based on shared history or universals, can account for these distributions? This collection of articles by prominent scholars in typology seeks to address these issues from a wide range of theoretical perspectives, utilizing cutting-edge typological methodology. 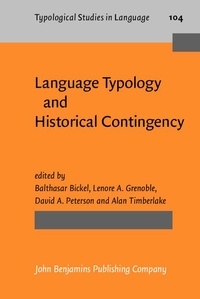 The phenomena considered range from the phonological to the morphosyntactic, the areal coverage ranges in scale from micro-areal to worldwide, and the types of historical contingency range from contact-based to genealogical in nature. Together, the papers argue strongly for a view in which, although they use distinct methodologies, linguistic typology and historical linguistics are one and the same enterprise directed at discovering how languages came to be the way they are and how linguistic types came to be distributed geographically as they are.